Brian recently picked up some bluefish from the local farmers’ market. It’s not a pick I’ve tried before, and I have to admit I was a bit skeptical. As the name suggests, the fish does indeed have a blue tint to it, though it gets lighter as it’s cooked. It’s also a bit more oily than my normal go-tos, but it’s loaded with protein (about 22 grams per serving). We decided on a simple foil pack filled with fresh lemon and herbs from our window garden. It was a quick and easy dinner to put together and I was pleasantly surprised with the outcome. The fish has a rich flavor, but I wouldn’t call it fishy. I think the lemon really helped to cut the fattiness and make this a nice, light summery supper. We paired ours with some roasted potatoes and sautéed kale and mushrooms. It all came together in about 30 minutes. Not bad! 1. Preheat oven to 350°F. Place two pieces of aluminum foil on you work surface (when folded, they should be large enough to cover the fish completely). Place 5 pieces of lemon, slightly overlapping, in a row in the middle of each piece of foil. Top each with a piece of fish and sprinkle the butter evenly over the top. Season with salt and pepper and top with the remaining lemons, creating another row on top of each. Evenly divide lemon thyme over the top of each and pour 2 tablespoons white wine on top. 2. Secure each foil pack by bringing your two longest pieces together and rolling them down to the fish and folding the sides in. (Don’t worry about making this part neat. 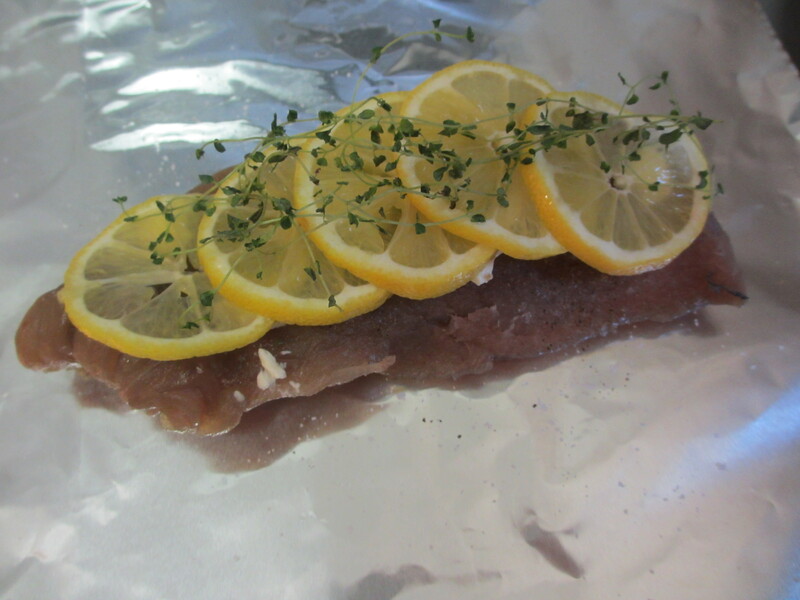 You just need to foil the foil down so the fish is sealed in so it can be cooked with steam). 3. Transfer packs to a sheet pan and place in oven. Cook for 20 minutes or until done. SWWU Tip 1: Bluefish does not freeze well. Cook this pick within a day or two of buying it. SWWU Tip 2: You can cook this in as many or as few foil packs as you like. Cook a whole 1-pound fillet for a nice group presentation or break it up into smaller pieces if you desire. 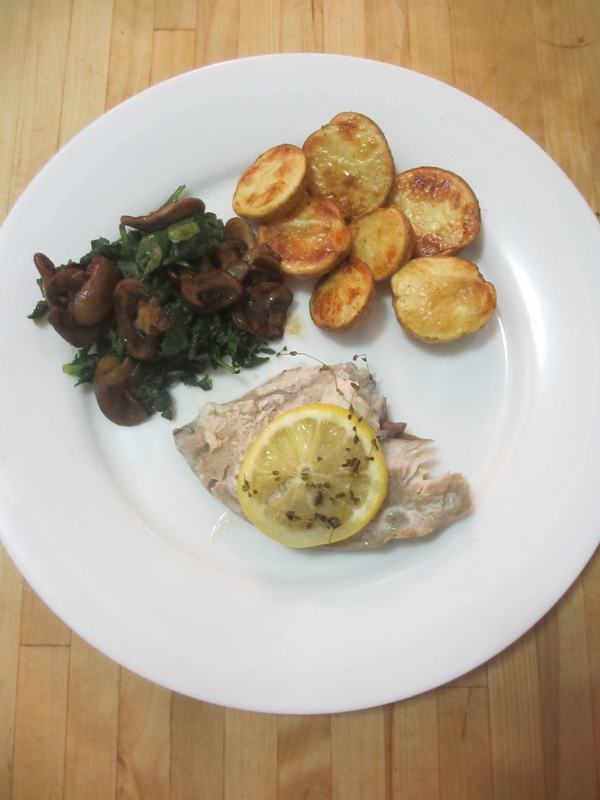 This entry was posted in In the Kitchen and tagged @SWWUblog, bluefish, dinner, farmers' market, foil pack, healthy dinner, in the kitchen, protein, quick dinner, recipe by Something We Whipped Up. Bookmark the permalink. Do you know that we’re obsessed with bluefish? Our way is a bit more lowbrow: smear a light coating of mayo on that fillet, dash of paprika, wrap in tinfoil, and bam! So good. We down it as if it were a milkshake. This sounds easy and delicious too. We’ll have to try it out sometime.